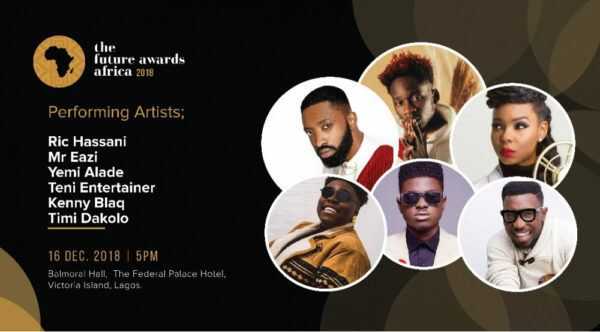 Popular artistes Mr Eazi, Yemi Alade, Timi Dakolo, Teni the Entertainer, Ric Hassani and comedian Kenny Blaq are set to perform this Sunday, December 16th, 2018 at the 13th edition of The Future Awards Africa taking place at The Balmoral, Federal Palace Hotel, Victoria Island, Lagos. With 100 nominees selected by the Central Working Committee this year, the awards event acknowledges their inspiring work and initiatives that have made an impact through social enterprise and creativity. It celebrates a new class of innovators, philanthropists, activists, technocrats and creators promoting the shared mission of changing the African narrative. The official hashtags for 2018 are #TFAA2018 and #NigeriasNewTribe.